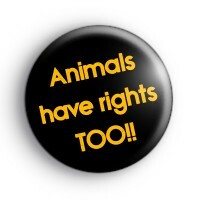 Animals have rights too badge in black with orange text. This badge is ideal for animals rights activists, vegans & vegetarians alike. For those of you who feel passionately about animal welfare, rights and are strongly against animal testing. We have a large range of environmental badges and animal rights badges, not to mention vegan and veggie button badges. So stand up and make your voice heard, for the animals! Our badges are 25mm (1 inch) badges made by hand in our workshop. Worldwide delivery available and free delivery available on larger orders.